RUSH: I want to show you something on the Dittocam. I got an email here. This is about yard signs. You know what I've been hearing is that people all over the country are afraid to put yard signs out because they're literally afraid of leftist mobs coming to their homes and not just ripping the signs out, but doing damage to their houses. So people who are tending to vote Republican are not putting yard signs up. Remember, we had a call here (this may be three weeks ago now) from a caller who said, "Rush, I'm worried. I'm not seeing any yard signs. "We saw Trump signs everywhere in 2016! I'm not seeing any yard signs at all." I said, "Well, they can't..." I looked into it and I found out that the left is scaring the hell out of a lot of people, and if that fright also includes scaring them not to go vote? There are a lot of people scared to death of these maniacs, and that's why yard signs are not being put out. Part of me understands it and another part of me is afraid. Yard signs? Are you kidding me? From the people that stormed the beaches of Normandy, you're afraid of yard signs? But it's a different era. These people on the left are crazed or doing a good job of making themselves look that way. So I have a video taken by a Ted Cruz worker. I'm not gonna show you video on the Dittocam. So I took a still shot that I want to pop up here just a second. This picture you're gonna see is from the video taken by a Cruz worker who was putting up Cruz campaign signs in a Houston neighborhood, Montrose. And there was this guy, demonic-looking guy following the Cruz supporter around, ripping up every yard sign, ripping it out of the ground and then ripping it to shreds. At one point he stormed the Cruz supporter, who was videoing him on his camera and got this demonic, threatening look on his face, starts shouting to the Cruz supporter how much he hates Cruz, despises Cruz. I've taken a still shot. I put it up there. This is the guy that was running around taking Cruz signs down, ripping 'em up out of yards. In this still shot, he is storming the Cruz supporter who's holding the camera. He actually got within two inches of the camera. I didn't still shot that for you 'cause all you would see is the guy's flaring nostrils. 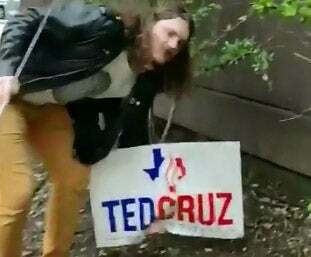 But this guy is out there following Cruz people around, taking the Cruz yard signs out, and then threatening Cruz supporters who videotape him doing this. By the way, this guy... He's a longhaired, maggot-infested rock 'n' roll type. You can see that. And he's wearing mustard yellow slacks. You don't see that in the still shot here. But this is happening all over the country in various precincts, districts, states, what have you.